I seem to have a theme going, here. Spring. It is, without a doubt, my favorite time of year in the high desert. I’m sure my loved ones wonder why in the world we are so grounded in this dry, little, desert town in the middle of nowhere. Well, as The Little Prince declares, “The desert is beautiful.” This desert has so much spirit and life and a view with no bounds. Spring Break is not what is used to be for this worker bee. 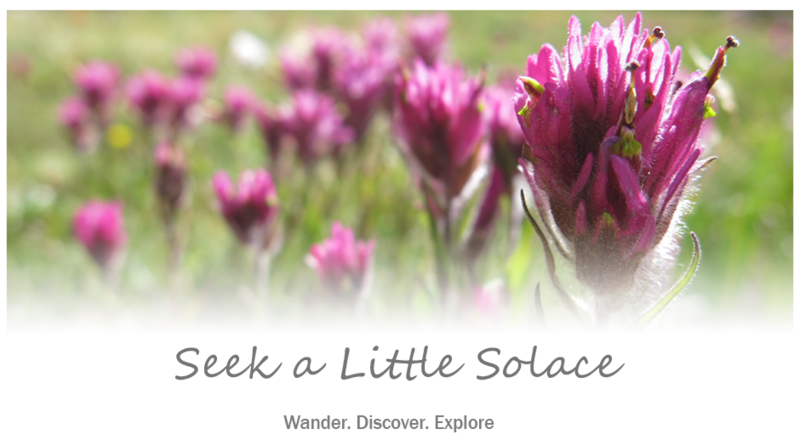 It used to be a week of rest, relaxation, outdoor adventure and wildflower hunts. Life gets busier as I get older…er...a little less young, as my hubby insists. These days I just look forward to some extra time to tackle my teaching tasks, trot the tail-waggers and get a handle on the household. I do so love springtime in this desert of ours, but it is fleeting. If you blink, you can miss it. So, I made a conscious effort to ditch the task list and get outside to play, at least once or twice during my Spring Break. When we first moved here, we discovered a playground of granite boulders where the local climbers like to go at lunchtime to practice their moves and improve their technique. 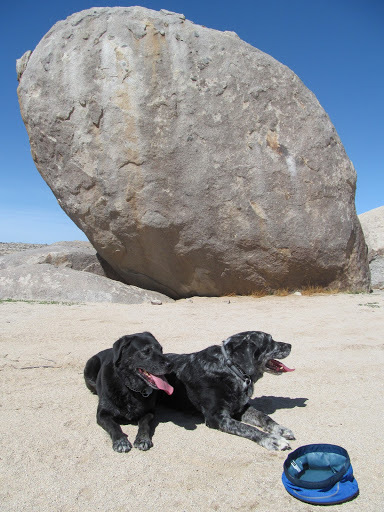 We spent quite a bit of time climbing those boulders and it was heaven for the mutts. 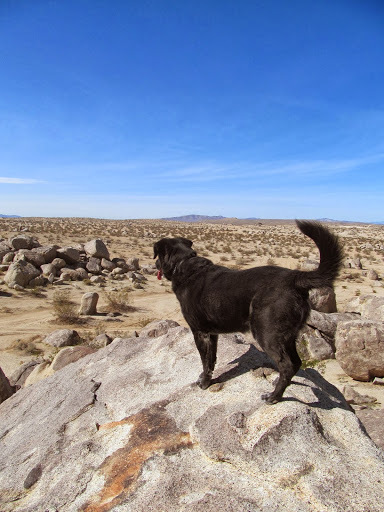 Who needs a dog park when you have these granite monoliths to scale? We haven’t been out there in a long while, so the pups and I took a lunch break one beautiful day and revisited the old stomping ground. Gosh, we love those boulders! It felt so good to shed the shoes and feel the cool rock beneath my toes. 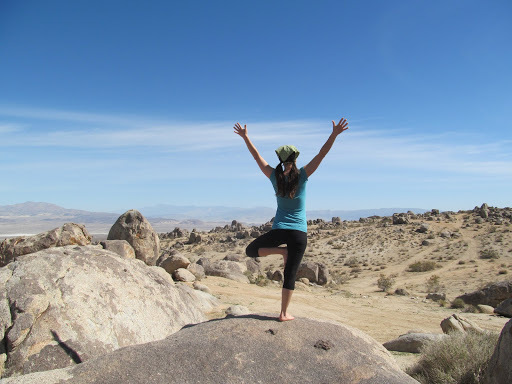 Who could resist a little boulder-top yoga? We had the entire place to ourselves. It felt amazing to open my heart and breathe in the landscape, the peace and the solace. I completely let go of the concept of time for a few hours and just enjoyed scrambling barefoot with my dogs from boulder to boulder. 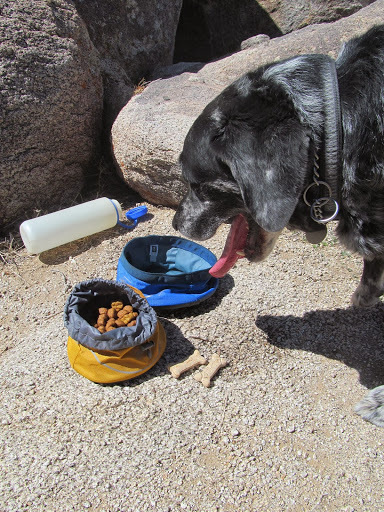 We enjoyed our desert lunch break so much, we decided to do it again a few days later. This time, we packed a picnic. 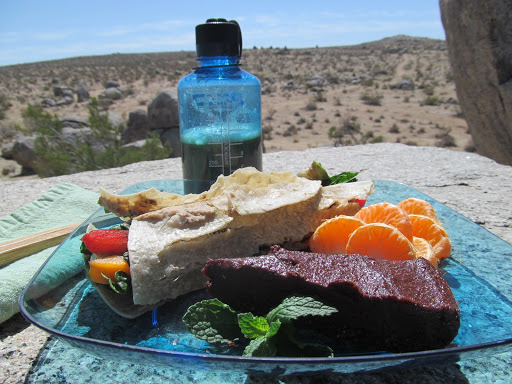 I filled my canteen with some freshly-juiced greens and scrounged up some healthy grub. I had some homemade Hemp and Kalamata Hummus in the fridge, so I smothered a brown rice tortilla and wrapped up some raw veggies and kale. The brown rice tortilla was no match for this dry desert air. It may not look pretty, but it was a delicious mess! 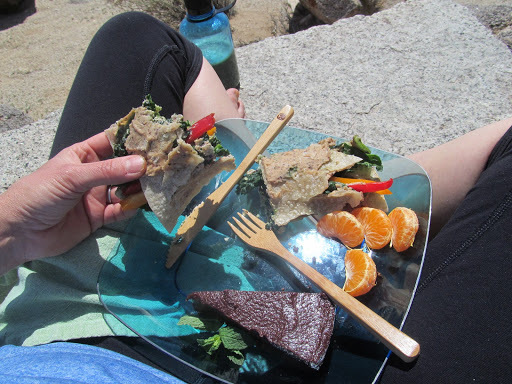 Some organic mandarins and a leftover slice of my raw, vegan, double-chocolate cake completed my picnic lunch. Superfood for me, doggie food for them. 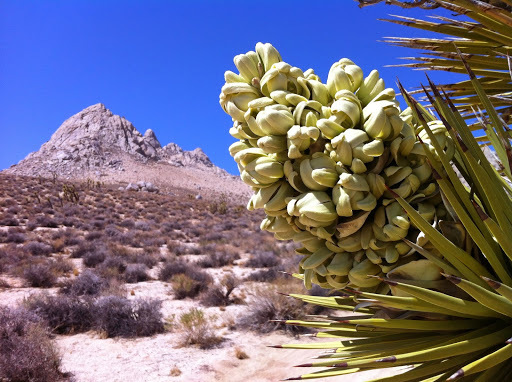 I was hoping to catch some desert blooms during one of my outings, but the wildflower hunt was tricky this year. It’s been a dry winter and my timing was less than magical. 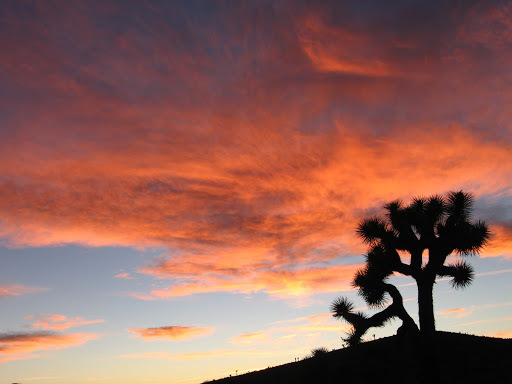 I did manage to catch the Joshua Trees in bloom on a walk one day with the hubby and the hounds. 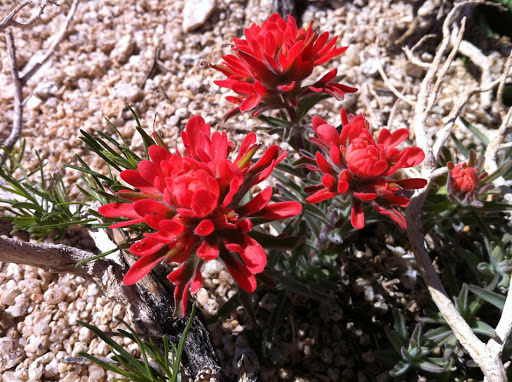 We also found a few scrawny Desert Paintbrush flowers. You can always count on those guys, they bloom anywhere! 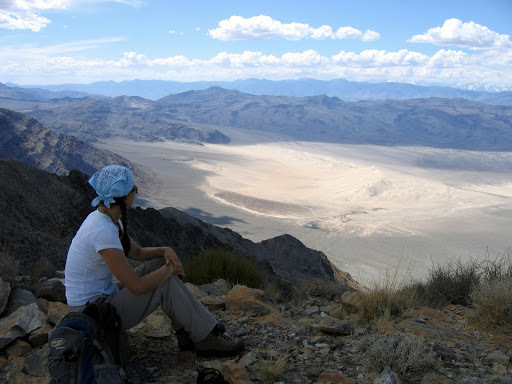 I have always loved the desert. One sits down on a desert sand dune, sees nothing, hears nothing. Yet through the silence something throbs and gleams… “What makes the desert beautiful,” said the little prince, “is that somewhere it hides a well…”.